The subconscious mind is highly sensitive to sound origins and character. So, we expect a high degree of auditory coherence between sounds in order to register them as genuine. Since we instinctively sense when sound information is inauthentic, recorded audio only sounds 'life-like' to the human ear when it maintains a full, natural consistency. True immersion is achieved when audiences are offered nothing less than a natural auditory spread. 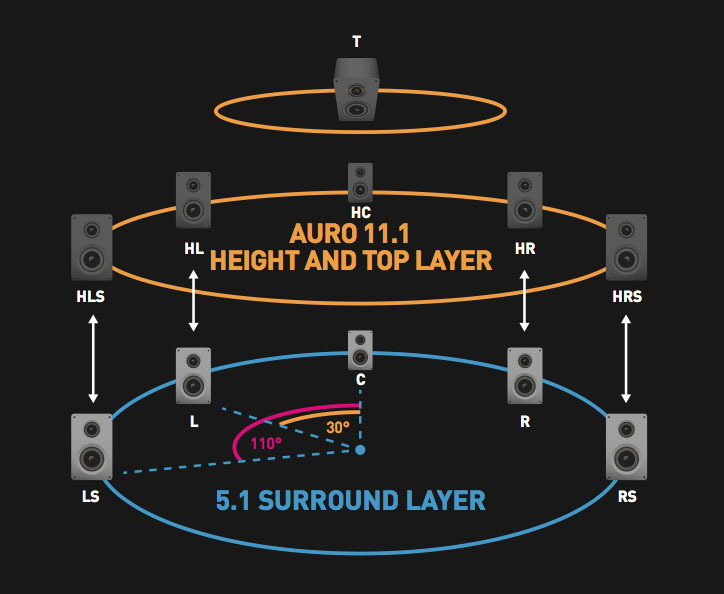 Auro-3D® features the critical component in the accurate playback of native 3D audio content - HEIGHT - by using a speaker layout that constructs three vertical layers around the listener. This advanced configuration is capable of reproducing highly accurate, native 3D audio for a superior immersive experience. 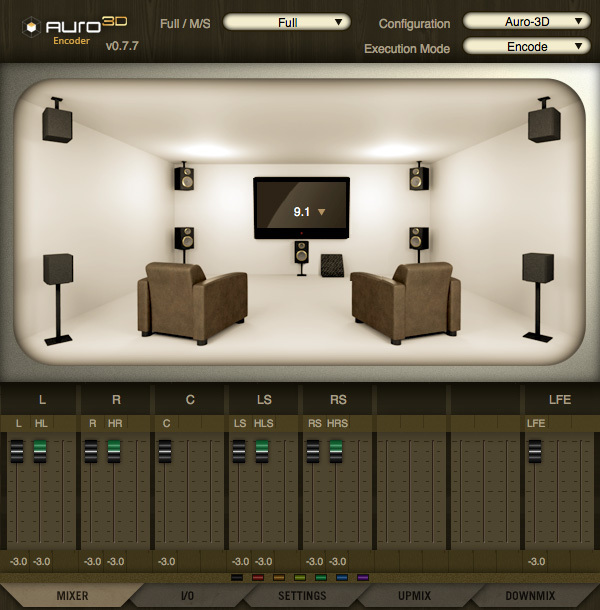 Native 3D audio recordings can only be made within a channel-based system like Auro-3D®. 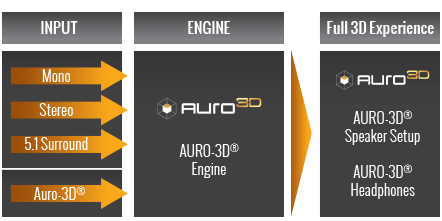 Natively recording Auro-3D® in an object-based format is simply not possible. All Auro-3D® listening formats have a Height Channel above and around the listener, which is crucial to a fully immersive experience. This is unattainable with only a Top Layer. Specially designed to capture the spatial effect of Auro-3D® in a portable, personal listening environment. The Auro-Codec (download PDF) was developed in response to many unresolved technical problems that have led to audio industry stagnation. Audiences have been forced to listen to 2D sound for the last 25 years with little improvement in resolution or effect. Auro Technologies has resolved these issues with its release of the Auro-Codec, the world's first and only codec that achieves full quality and compatibility by hiding code directly within the uncompressed audio domain. The Auro-Codec boasts backwards compatibility that allows for the simultaneous distribution of multiple playback formats in one single stream. 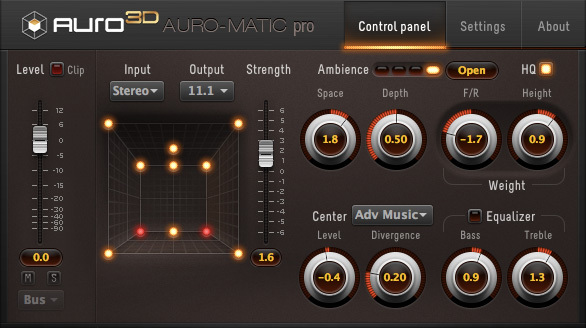 Auro-Matic® Pro is a unique creative tool that transforms legacy Mono, Stereo and Surround content into a natural 3D or 2D listening experience. Panning in a 3D environment. 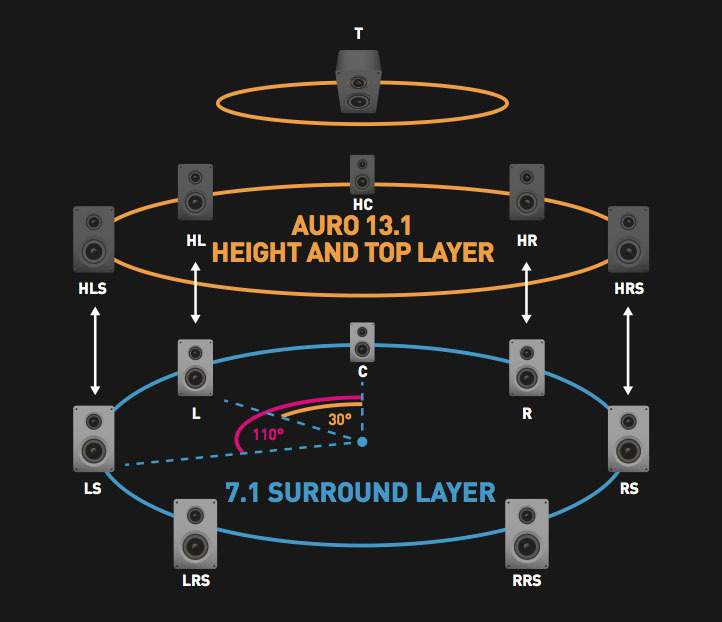 The Auro-3D® Engine combines different technologies to guarantee an optimum 3D sound experience generated both natively and from existing audio content.  It recognizes Mono, Stereo, 5.1 Surround or an Auro-encoded signal and transforms them into 3D audio. Regardless of original format, you can always experience the stunning effect of sound in 3D. 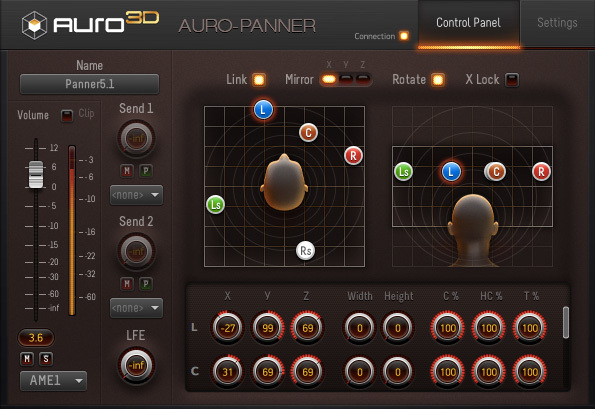 Auro-Matic®: The groundbreaking up-mixing algorithm that converts legacy content into the Auro-3D® format. Auro-3D® Headphones: Like other Auro-3D® configurations, similar 3D audio results can be achieved with headphones that use binaural technology. PCM (Pulse Code Modulation) = A technology used to convert analog sound into uncompressed digital audio. In the early days of the Internet, severe bandwidth restrictions prevented the streaming of uncompressed audio. Lossy audio codecs (e.g. mp3, AAC used by iTunes) were subsequently developed to accommodate these limitations, precious audio quality being traded for more convenient file sizes. This compression trend led to the development of a wide variety of codecs and corresponding decoders, resulting in a market filled with conflicting formats. Consumers were not only being bombarded with incompatible codecs, they were also being sold an inferior product - the compression process produced sound artifacts that were both audible and caused measurable listener fatigue. Current access to inexpensive, high speed Internet has eliminated the need for these lossy codecs. PCM, the worldwide digital standard for uncompressed audio, can now provide the high quality CD-sound demanded by the broadcast industry, creative professionals and consumers. Auro-3D®'s magic lies in its ability to deliver PCM quality despite the use of bandwidth compression because it stays within the uncompressed audio domain. 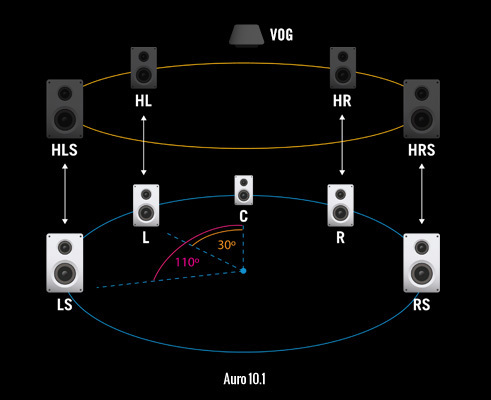 The groundbreaking Auro-3D® codec remains invisible, allowing the encoded audio stream to remain within PCM. Auro-3D® aims to achieve the most IMMERSIVE 3D audio experience in the industry while taking into account the developing market trends. Our format combines the highest backwards compatibility with the maximum quality and flexibility. It is the most cost-effective solution that provides both industry and consumers with unparalleled results. 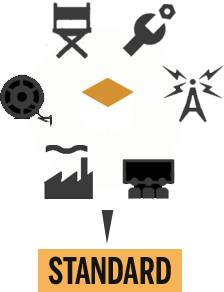 distribution and integration capabilities across all formats and industries.